Let’s take a look back—way back—to give you a glimpse of almonds’ impressively enduring history. Turns out, we modern-day almond lovers are in very good company. 1400 BC: The Bible’s Book of Numbers tells of Aaron’s rod that blossomed and bore almonds. Fancy that. 100 AD: Wedding gift idea alert. The Romans showered newlyweds with almonds as a fertility charm. 600-900 AD: Almond trees flourished in areas such as Spain, Morocco, Greece, and Israel, and their harvests fed explorers traveling the Silk Road to China. 1700s AD: Franciscan padres brought the almond tree from Spain to California, but the moist, cool weather stalled successful planting until the next century. 1900 AD: By the turn of the 20th century, California’s almond industry was firmly established, and crossbreeding had created several of today’s commonly crunched varieties. 2000 AD: In the past 30 years, California’s almond yield has quadrupled, covering more than half a million acres in the lush San Joaquin, Fresno and Sacramento valleys. Today: Almonds are California's top agricultural export and largest tree nut crop in total dollar value and acreage. They also rank as the largest U.S. specialty crop export. The Bible’s Book of Numbers tells of Aaron’s rod that blossomed and bore almonds. Fancy that. Wedding gift idea alert. The Romans showered newlyweds with almonds as a fertility charm. Almond trees flourished in areas such as Spain, Morocco, Greece, and Israel, and their harvests fed explorers traveling the Silk Road to China. Franciscan padres brought the almond tree from Spain to California, but the moist, cool weather stalled successful planting until the next century. By the turn of the 20th century, California’s almond industry was firmly established, and crossbreeding had created several of today’s commonly crunched varieties. In the past 30 years, California’s almond yield has quadrupled, covering more than half a million acres in the lush San Joaquin, Fresno and Sacramento valleys. 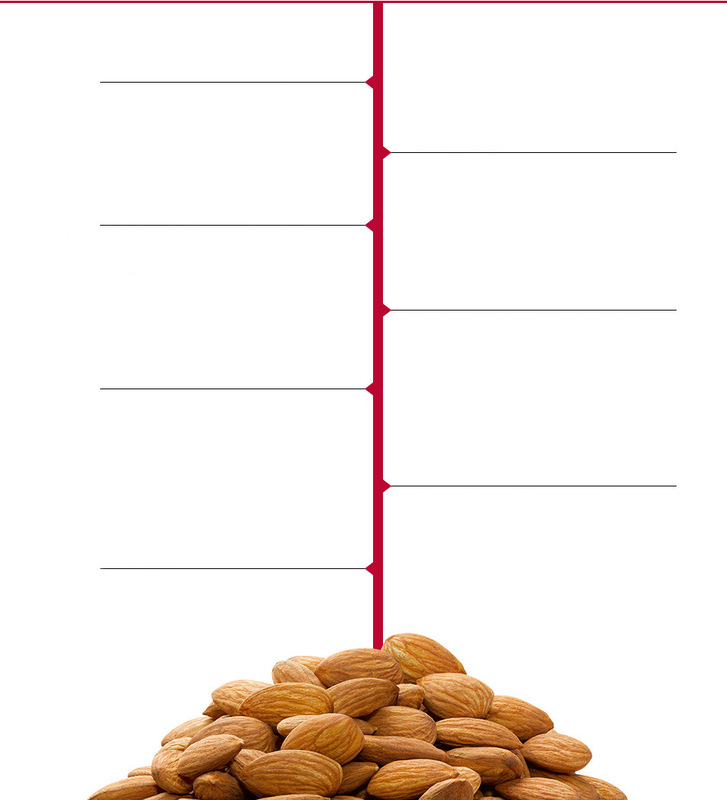 Almonds are California's top agricultural export and largest tree nut crop in total dollar value and acreage. They also rank as the largest U.S. specialty crop export.